Can You Die From a Bowel Blockage? Can Excessive Crying & Strain in Infants Cause a Hernia? Does Stretching the Bowel Cause Back Pain? Does Lifting Weights Affect an Inguinal Hernia? Ventral hernias are caused by loops of intestine bulging into weakened areas on the abdominal wall. A hernia that develops at an old surgical incision site is called an incisional hernia. Ventral hernias can also be caused by obesity, pregnancy, heavy lifting or frequent coughing. Most of the time, the loop of intestine can be easily reduced, or pushed back inside the abdomen. If a piece of intestine gets trapped inside the bulging space, it’s said to be incarcerated. Untreated incarcerated ventral hernias can lead to further complications, some life-threatening. Incarcerated ventral hernias usually don’t cause much pain, but a permanent lump develops at the site. 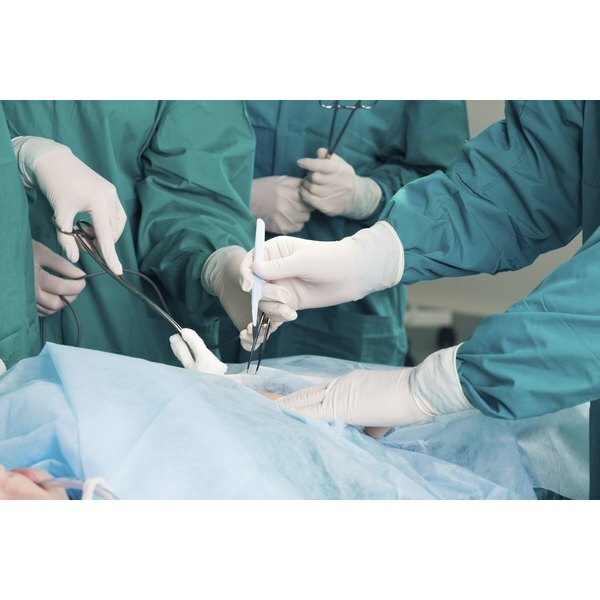 Increasing pain in an incarcerated hernia indicates possible hernia strangulation, which occurs when the trapped bowel swells in the tight space cutting off its blood supply, surgeon Mark Fusco M.D. of Melbourne, Fla. states on his website. Bowel death, also called necrosis, can occur within six hours of strangulation, according to the Merck Manuals Online Medical Library. A strangulated ventral hernia causes severe abdominal pain, fever, rapid heart rate and abdominal tenderness. Vomiting often occurs because the strangulated area blocks passage of digested material. Strangulation is a medical emergency that requires immediate surgery to prevent further complications. If the strangulated bowel trapped in an untreated ventral hernia dies from lack of blood supply or becomes infected, the bowel often ruptures, spilling its contents into the abdominal cavity and causing an infection called peritonitis. Peritonitis, infection of the lining that covers the abdominal wall and the abdominal organs, causes severe, continually worsening abdominal pain with muscle rigidity and tightness along with fever, vomiting and fast pulse. Septicemia, spread of the infection through the bloodstream, can cause shock, with low blood pressure and multiple organ failure that can lead to death if not promptly treated. Antibiotics are given intravenously to treat peritonitis. If part of the bowel trapped in the ventral hernia strangulates and develops necrosis, the dead bowel tissue will need surgical removal or infection could spread. All dead bowel tissue is removed and the healthy ends of the remaining bowel are joined together. People who need bowel resection are more likely to develop sepsis.